Arsenal continued their push for a top four finish with a 5-1 mauling of Bournemouth which keeps marginally ahead of Manchester United and Chelsea for a coveted Champions League position. With the race for the top four intensifying by the week, Arsenal gained a crucial three points ahead of a crucial North London Derby on Saturday. Mesut Ozil opened the scoring after just four minutes and Henrikh Mkhitaryan doubled Arsenal’s lead before Lys Mousset pulled a goal back for the visitors to give them hope in a game that could have already been out of sight at the break. Any hopes of a Bournemouth comeback were scuppered when captain Laurent Koscielny added a third for the Gunners. The scoring was then completed by Pierre-Emerick Aubameyang who rounded Artur Boruc to score before Alexandre Lacazette fired home Arsenal’s fifth with a precise free-kick. The omission of Ozil has caused debate among Arsenal fans all season and with if his performance against Bournemouth is anything to go by then the calls for the German to be a regular will continue. Making just his second Premier League start of 2019, Ozil opened the scoring at the Emirates as he drifted into the space between the two Bournemouth centre backs and audaciously lifted the ball over Boruc with a trademark ‘Ozil bounce’ finish. The German playmaker was then involved in Arsenal’s second as Mkhitaryan fed a through ball to Ozil in acres of space in the box once again, but instead of going for goal Ozil unselfishly cushioned the ball with a first-time touch for Mkhitaryan to finish. Ozil came close to claiming a brace in the second half when he met Aubameyang’s cross with a first time shot which bounced off the post. 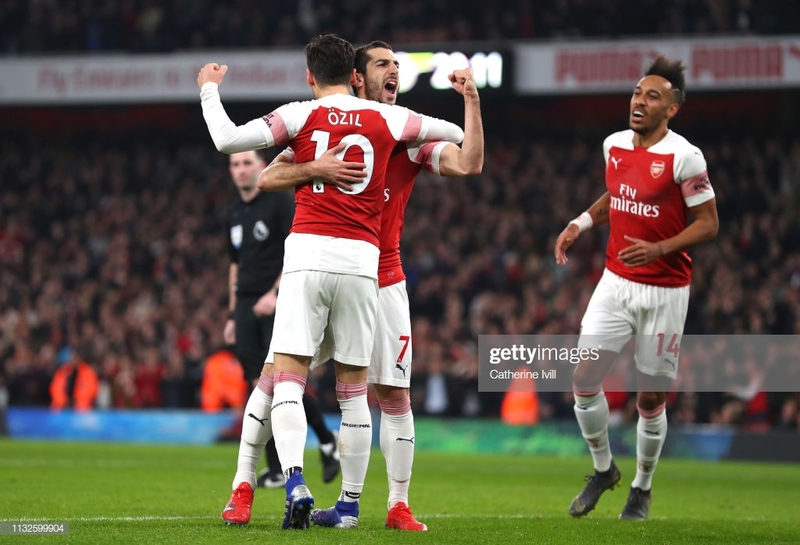 Ozil and Mkhitaryan continued to link up throughout the game and created fluidity in Arsenal’s attack which has recently been criticised for being too rigid and lacking in ideas in recent games. Mkhitaryan continued to find space throughout the match and enjoyed one of his best games in Arsenal shirt since joining the club just over a year ago. His pinpoint through ball with the outside of his foot found Aubameyang through on goal as the Bournemouth defence were carved open once again and the Gabonese striker rounded Boruc and finished to put the result beyond any doubt. Despite enduring a turbulent time in England, the Armenian midfielder is beginning to show signs of his best form which were seen so prominently during his time at Borussia Dortmund alongside current Arsenal teammates Aubameyang and Sokratis. Having just returned from injury, Mkhitaryan looks a rejuvenated player and added to his goals and assist tally last night which sees him boast an impressive six Premier League goals and four assists in just 12 starts this campaign. With both Mkhitaryan and Ozil vying for starting positions amid their recent good form, Unai Emery has some big tactical decisions to make as Arsenal travel to Wembley to face their bitter rival Tottenham Hotspur. Arsenal enjoyed arguably their best game in the Emery era thus far earlier in the season against Spurs, which saw the Gunners complete a dramatic turnaround to win 4-2 at the Emirates Stadium. Emery’s half-time substitutions in that game made all the difference as Aaron Ramsey and Lacazette replaced Alex Iwobi and Mkhitaryan. Emery may be tempted to use Ramsey who has a wealth of experience in these types of games and was a big part of Arsenal’s intensive pressing which led to their second-half comeback. While it may be seen as a tactical risk to start two strikers against such tough opposition, Emery may want to use the firepower of his two assets upfront in Aubameyang and Lacazette to bolster Arsenal’s attacking threat. Lucas Torreira was a monumental part of Arsenal’s derby victory back in December, putting in an exceptional shift in central midfield and was rewarded by scoring Arsenal’s fourth to lift the roof at the Emirates. Emery will surely opt with Torreira alongside Granit Xhaka who was seemingly rested for yesterday’s game against Bournemouth. The defence is arguably an even bigger issue for Emery to decide ahead of Saturday’s derby with Arsenal transitioning between playing five at the back and four at the back in recent months. The home victory against Spurs saw Arsenal line-up with five at the back, however, they will be without Hector Bellerin and Rob Holding, both of which played such a crucial part in that system last time around. Sead Kolasinac has proved to be one of Arsenal’s most pivotal players, providing such a strong outlet when attacking but has a tendency to neglect his defensive responsibilities when played in a back four, which may influence Emery to play five at the back with Sokratis, Koscielny and Shkodran Mustafi likely to be the trio in the centre. A lack of cover at right-back saw Carl Jenkinson make a surprise start yesterday, his first Premier League appearance in over 800 days. Emery will be hoping that Ainsley Maitland-Niles will be available with other right-back option Stephan Lichtsteiner looking particularly vulnerable in Premier League games this season.